What will a person not do because of love? With love, the seemingly absurd and impossible becomes logical and likely. Love is what drives us to actions and accomplishments, from the noblest and greatest to ordinary and poignant. To paraphrase the famous early twentieth century English author G.K. Chesterton, something becomes great or beautiful or indeed lovely because we love it. Not because it was great, beautiful, or lovely before we came. This is because love is transformative. Because love drives us to do, the thing we love is changed and made even more lovely in some mysterious way. This relationship is evident all around us, but I find it to be particularly arresting in certain situations. 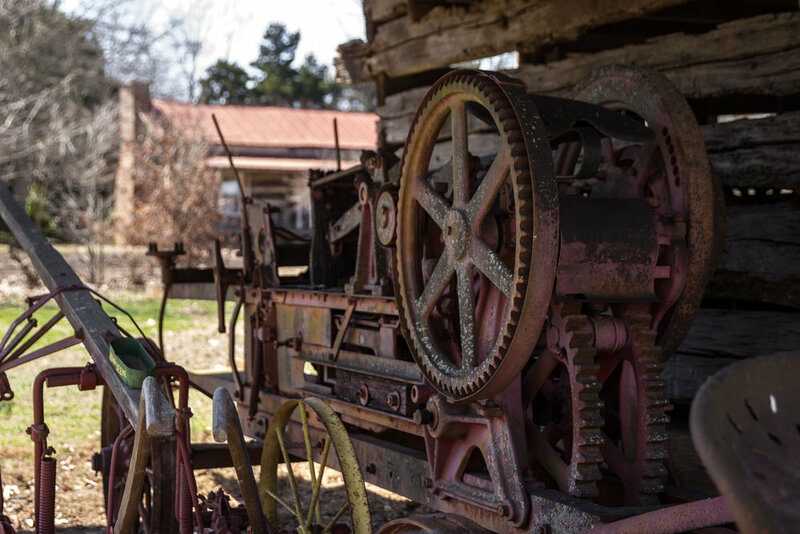 A mere twenty miles northwest of Jackson, Tennessee, in between Bells and Alamo, lays Green Frog Farm, a thirty-five-acre re-creation of an early industrial Southern community named for a small, long forgotten local store. And it is all thanks to the work and love of one man: Dr. John Freeman. 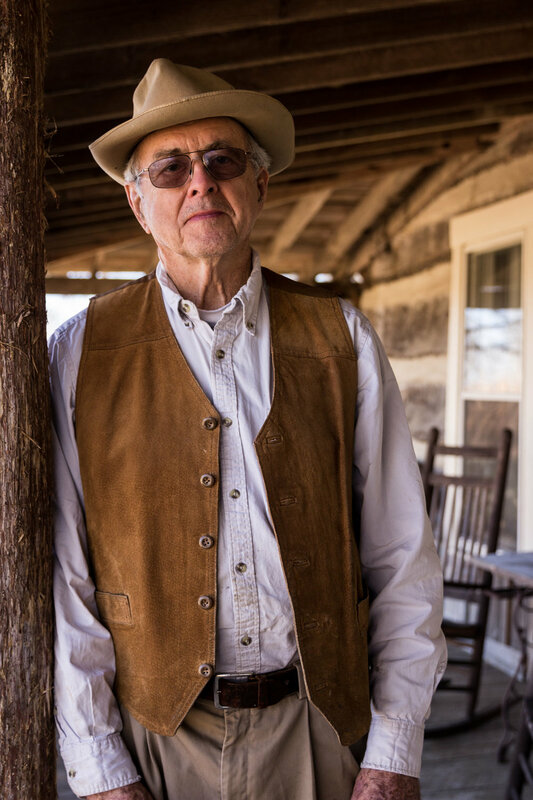 Dr. Freeman was born in South Texas, went to medical school in South Dakota, and served as a missionary on the border between Burma and Thailand for ten years before coming to West Tennessee in the early 80’s. His family moved onto the farm where his mother had been born and which his family had owned since the early twentieth century. Up until this point, there might appear to be nothing abnormal going on here, just a man returning to his family home after years spent working overseas—but there were hints of something much greater happening beneath the surface. Dr. Freeman became interested in history while on that distant missionary outpost. It was near the location of the gruesome and appropriately named Death Railroad, built by the Japanese during World War II using the labor of over 60,000 prisoners of war, over 12,000 of which died in the construction. He began collecting relics from the area and came to meet a number of the survivors of the railroad as they returned to area. He learned their stories and came to realize that history is a fragile thing; those relics and stories often disappeared and with their owners. It was also in the jungles of Thailand that he began building things. He helped in the repair of the steel truss bridge near his missionary station, and this fascination with building and history came back with him to West Tennessee. It was not too many years after his return to the area that Dr. Freeman became captivated by an interesting confluence of these two loves. Log buildings of the sort that once were common throughout West Tennessee are impressive structures made from huge sawed square beams. 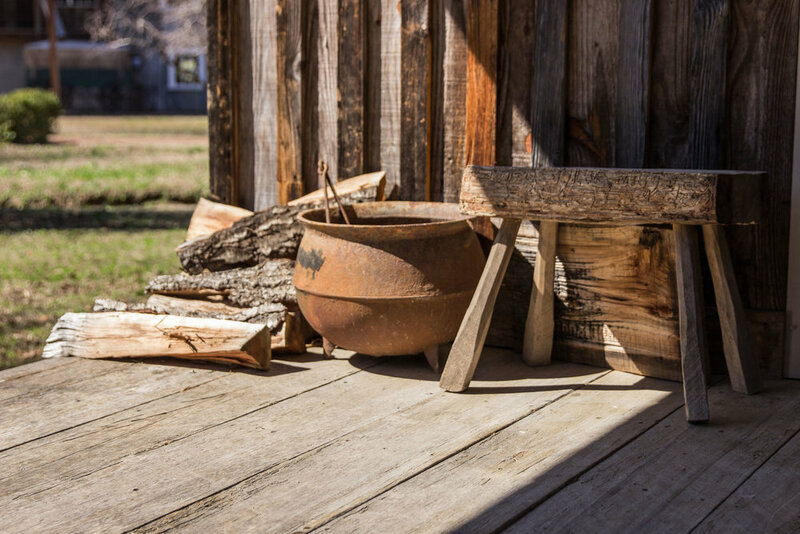 It was these logs and the history that they represented that Dr. Freeman came to love—their massive size and weight, their bright or muted color depending on the type of wood, their rich and deep grain. They and the buildings which they made were fast disappearing, and Dr. Freeman’s love led him haphazardly into the creation of Green Frog. I don’t mean to suggest that the Green Frog Farm is a “haphazard” place, but that it wasn’t Dr. Freeman’s plan to build this; it just sort of happened. It began with a small cypress log building in 1994, taken in because he loved the richness of cypress wood and couldn’t bear to see the big, square-cut logs sawn down into planks. Soon more buildings came to his farm. Most were local and only had to be moved to the farm from other places in Crockett County, but many came from more distant locations: the Missouri Bootheel, Sardis, and Dickson. Some of the machines found in the buildings have made even longer journeys, such as the Linotype machine all the way from South Dakota. So much came over time that Dr. Freeman bought thirty-five acres next to his family farm to keep it all, and it was on this land that he began slowly to construct what would be called Green Frog Village. 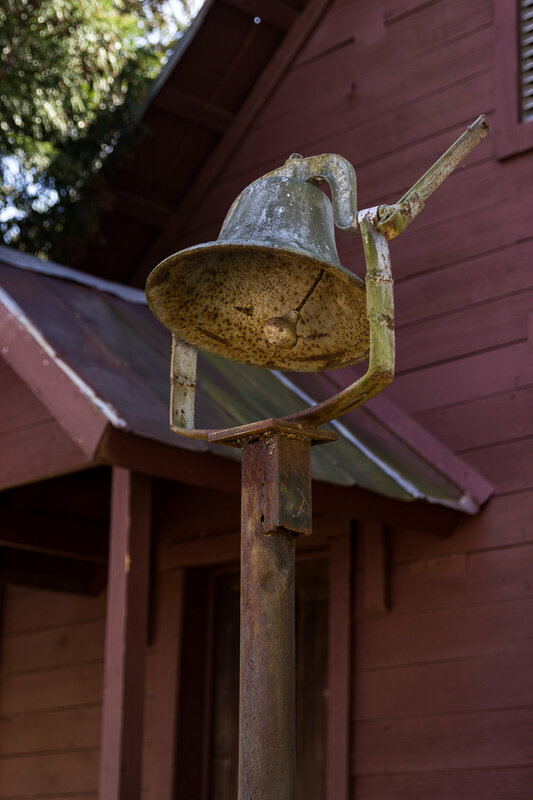 The village consists of a print shop, chapel, period-style clothing shop, general store, large mule barn, working wood cotton gin, and three cabins that function as bed-and-breakfasts, just to name a few. 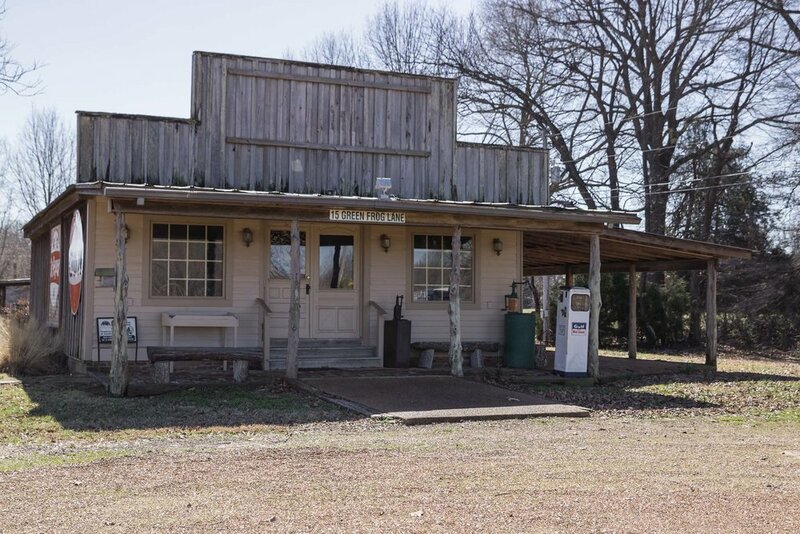 In all, there are over twenty buildings on the farm with more and more still coming, including two more cabin B&Bs, doctor’s and dentist’s offices, a working blacksmith’s shop, and an old steam saw mill. And while Dr. Freeman built and planned all of this just for the love of it, to share the history of the buildings and things with anyone who would stop by, it has in the last few years moved, with the help of his youngest daughter Krista, from a non-profit to a for-profit business, hosting events, weddings, and photography sessions. (Hence the recent name change to Green Frog Farm.) The Jackson Area Plectral Society holds barn dances around once a month in the large former mule barn. A small congregation meets each Sunday in the chapel. Photographers book sessions to have the beautiful buildings and setting as backdrops for their pictures. Young couples visit throughout the year to plan their dream weddings. It seems incredible and a bit preposterous that all of this could have been done by one man—and it is. It was a love—of the buildings, the special things they held, and the history that they can tell—that would lead someone to go through all the trouble and expense of moving these old and large structures to carefully reconstruct them—not to the way they were but better: the way they should be. That is what real love does: it loves things where they are, but it doesn’t love them to leave them that way. It takes things that are broken, flawed, and rejected and transforms them through its power into what they were always meant to be. Dr. Freeman loved these buildings when no one else did. Now they sit on a beautiful farm waiting for you to come inside. Green Frog Farm is located at 15 Green Frog Lane in Alamo. For more information, visit their website or call 731.663.3319 to reserve a time to tour the village. Photographer Katherine Cheshire is a student at Union University. She is currently interning at the Jackson Chamber and enjoys reading, journaling, and eating donuts.